A music documentary by filmmaker B. Out of Pilgrimm Pictures. Visits to the Horniman Museum and historic sites in London, interviews with a.o. ; Douglas Rogers, Steve Dickinson of Wheatstone and Pietro Valente. Impressions of "Hands on Music weekend". Lots of music. Classical Music (1840-1912) for Wheatstone's Concertina 1840 - 1912 by Pauline de Snoo, concertina and Chris van de Kuilen, piano. 2016. Sheetmusic with the cd free as ebook (pdf) on request. Sheetmusic with the cd available as ebook (pdf) on request except the music by Frank Bridge which is available from any music shop. Integral recording during rehearsals from 2012 / 2015. 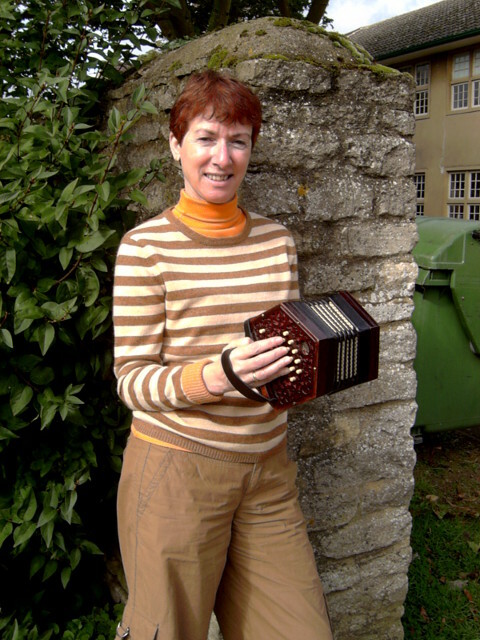 Pauline de Snoo on English Concertina and Chris van de Kuilen on piano. 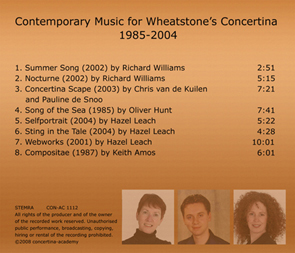 Contemporary music (1985-2004) for Wheatstone's concertina played by Pauline de Snoo on concertina and Chris van de Kuilen on piano. Voice Katrien Verheijden. Released February 2008. Richard Williams composed several pieces for concertina. Two of the pieces for piano and concertina are on this cd: Summer Song and Nocturne. Chris van de Kuilen and Pauline de Snoo together composed Concertina Scape during their studies at Fontys Conservatorium. It is a piece in four parts which reminds one of the moods of a big city, e.g. stillness of dawn, traffic in rush hour, lay out of a city, romance of a hot summer afternoon. Oliver Hunt (1934-2000) taught composition and guitar at the Royal College of Music. He composed Song of the Sea in 1985, dedicated to Douglas Rogers. Much of his melodic material is from the sea shanty "Windy old weather", although the theme is not stated in full until the very end of the work. It is programme music of a sort, with various passages being evocative of quiet waves, sea gulls floating in the sky, etc. Hazel Leach, composed Webworks first and some years later the two songs for trio (voice, concertina, piano): Selfportrait and Sting in the Tale. She originally wrote the songs for the Big Band United Women's Orchestra, of which she is also one of the conductors and bandleaders. Keith Amos was commisioned in 1987 to write Compositae by Douglas Rogers. CD review by Paul Walker as published in CW 459 2014. Within 70 seconds of loading this CD, I was aware that I had stumbled across what I consider a ground-breaking album. One that, without fuss, bypasses all the hyperbole, by delivering music written and played by the concertina, for 20th century and 21st century sensibilities. Of the eight compositions on the CD only two were written pre the Millennium; however it says little for my awareness of the music scene in that the CD was produced in 2008 and so it has taken me six years to find out and enjoy it. 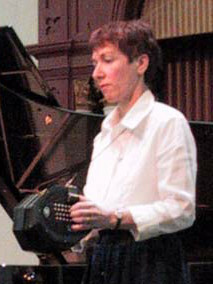 The concertina player is Pauline de Snoo, ably and dexterously accompanied by Chris van de Kuilen on piano. Two songs are interpreted by Katrien Verheijden. I love traditional folk ballads, but these songs deal with 21st century existence without the triteness of a pop song. It is difficult to describe the genres: at a guess I would say modern jazz/classical. 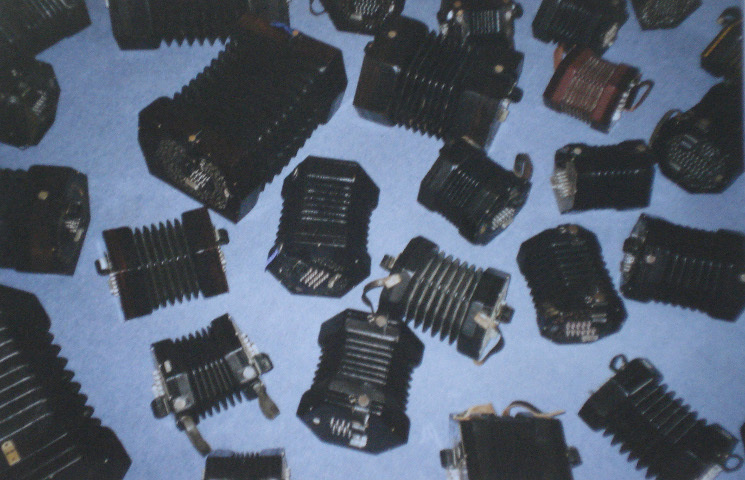 Chord progressions and melodic structures are unfamiliar, whilst the full range of the 48 key English concertina is used. Even the bat squeaks at the top of the keyboard! The CD reminds me in parts of Escalator over the Hill by Carla Bley. Yet it is not remote or dissonant. The melodies and tempo are far from folk music, or my usual listening fare - roots rock rhythms. It is a source of regret to me that the concertina is so little utilised in this area, although the bands playing in Bolivia and South Africa encourage me to look for more. 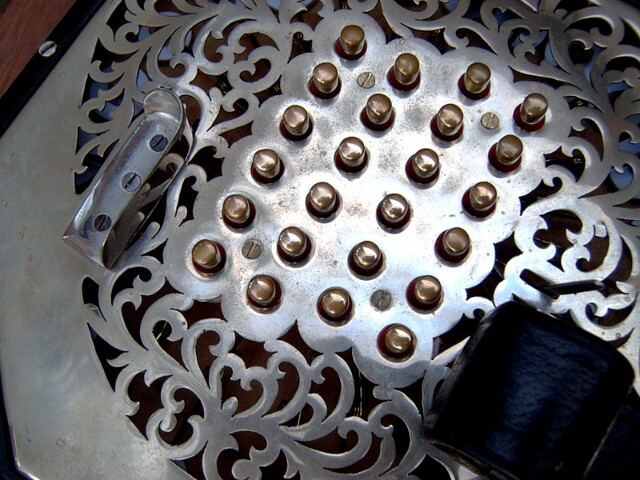 The playing throughout is expert; recording is crystal clear and the timbre of the concertina is a delight. One track is reminiscent of a French accordion, in others its metal ended tone is mercury bright, rising and falling on melodies that are emotional without being melodramatic or hackneyed. 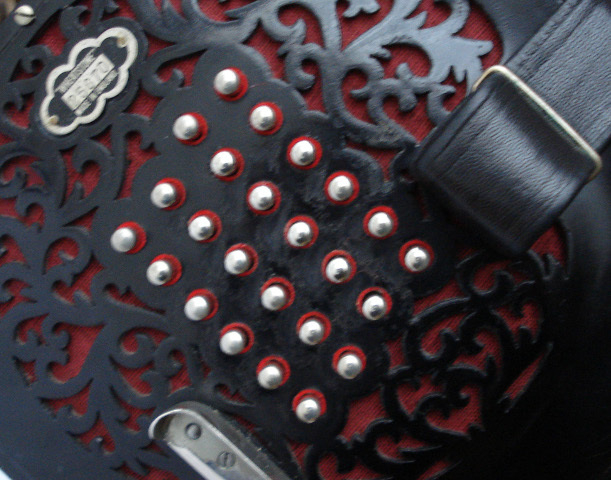 Even dense concertina chords, which can be spoiled on some models/boxes by overtones, ring true. I only have one complaint - why has it taken so long for a follow-up CD! Pauline de Snoo is self-effacing as regards credits on the sleeve. However this CD is a tour-de-force by her: the playing staccato or legato where required. Her style is fluid yet classically restrained - not the easiest thing to do on the English concertina. I am aware of no other CD that so clearly states, "Composers - you have another voice, another colour in your palate; the concertina is ready to express jazz and modern classical, whatever genre you choose to express yourself in." Katy & Pasko Cd with singer Katy, concertinist Pauline de Snoo and band. It consists of a whole new repertoire of songs. You can recognize classical, jazz and folk influences. The great Giulio Regondi volume I and II. The Giulio Regondi Guild: David Starobin, guitar; Douglas Rogers, concertina; Julie Lustman, piano. Published by Bridge Records NY. BCD 9039 and 9055 Avalaible from any larger recordshop.